Electricians Wakefield provides all key electrical services to commercial retail outlets, industry and the domestic field. As the number 1 electricians in Wakefield, Wakefield Electrical undertake electrical installations within the new build residential sites throughout West Yorkshire and are proud to work alongside the leading names in the commercial shop fitting sector. We can install external security lights to your home or premisis to deter potential theives, Industrial LED lighting Wakefield - Commercial LED lighting Wakefield - Residential LED lighting Wakefield. Fire rated downlights in the home are a requirement as opposed to the steel press donwlights. We have a full range in stock and can upgrade existing external and internal lighting installations. There is nothing more crucial to ensuring electrical safety within the home as a 17th Edition RCBO Metal clad fire rated fuse box Units installed by Wakefield Electrical. It is far more easier to have a RCBO fusebox installed than a split load type as with the RCBO fusebox if a circuit develops a RCD fault then it stays limited to that one RCBO device as opposed to isolating a complete bank of several circuit breakers. We offer fixed prices for our Wylex branded RCBO fuse boxes as we buy in such bulk we can pass the savings onto you the customer. Out-of-your-way, instant-on, Quartz Heaters let you enjoy your patio even on cool evenings. We install Infra red heating outside public houses, home patio seating areas, inside your workshop, Call for a quotation. Wakefield Electrical Ltd are a underfloor heating Electrical Installation company that specialise in all types of under floor heating. From carbon film to lose wire systems, concrete sub floor, wooden sub floor we can install a tailor made underfloor heating system in Wakefield to suit your needs. Email us with the walk area dimensions and we will respond with a quotation and system designed for your installation in Wakefield. CCTV systems, whether it's for your business or home, is a highly skilled area for Wakefield Electrical Services. 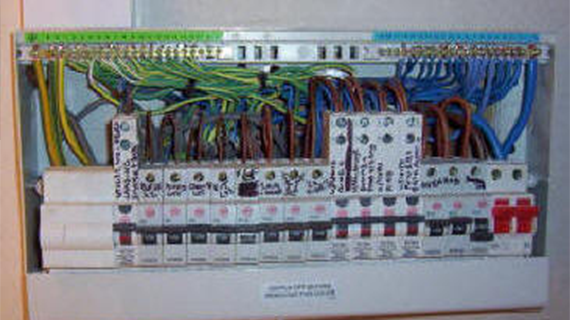 A question many house owners, and more often potential house buyers ask themselves is "does this place need a re-wire?" we can answer this for you. Did you know, we also perform electrical inspections? Contact us – we will arrange a time that suits you.